We went to Port Salut this afternoon. ..our day off before we continue clinics again tomorrow. 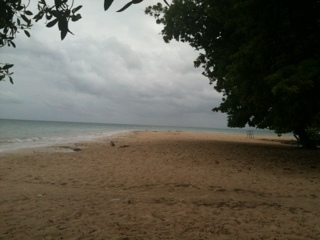 Unfortunately there is a tropical cyclone brewing so the day was cloudy but it was still nice to be on a beach. 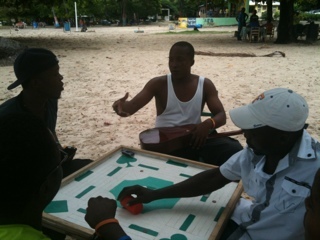 Our Haitian team members brought a game board and played "Rum"; turns out it is like Sorry or Parcheesi. Tonight we had pretty much decided that the weather is too iffy to attempt an overnight on Monday followed by a river crossing on Tuesday. Our decision was confirmed when Pastor Saurel phoned to say it was already raining heavily in Platon and it wasn't a good idea to try to get up the mountain. Now we are in punt mode as we try to make plans for the next two days. If the rain comes it will probably mess up Wednesday's plans also.